It's Tuesday, and I hope this week has gotten off to a good start for you. Me, yes. I'm really enjoying my day off from work. No, I'm not sick. Just a scheduled day off. I have no plans to drive into town, and the snow has been falling for a few hours now. So, it's good to be 'isolated' and no deadlines to get to. For those who know me, I get up early, everyday. Yes, even Saturdays, Sundays, and days off. So, this morning I was looking at some of my bookmarked favorite blog challenge sites, and well I found three I can enter. So, here they are: the Sketch (lay-out) came from Card Patterns, the Color scheme came from CR84FN Color Challenge, and the 3-D/Template challenge came from Just Us GirlS. Lets start with the 3-D/Template Challenge. Just Us GirlS, wants you to create a 3-D item, using a template. Easy peasy, right? I wanted to create a card & gift in one. So, I remembered that I had purchased a template from Adela Rossol, it was the Gift & Card Combo. Just Us GirlS, also has a few requires, they want us to include: ribbon, button(s), and flower(s). Sounds pretty, and girly, and that I can do! I needed a color scheme to get going with papers and embellishments. I headed over to CR84FN color challenge. This week, they wants us to use Kraft, Yellow, and Gray. Sounds pretty. And if you look at the inspirational photos, there are butterflies, doilies, lemons and a heart. I can use those. Now, for a layout. I headed over to Card Patterns, they always have a great design. Easy to work with. In their directions, they say you can rotate the sketch, so that is what I did. I needed one that is vertical. For those who know me, if you take away any company/manufacture restrictions, I can use just about everything in my craft room. And with no company/manufaturer requirements, that's what I did! Lets get started with pattern paper. 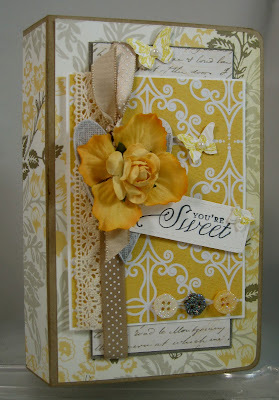 I used paper from Cosmo Cricket, Memory Keepers, and Melissa Frances. (I used papers from my scrap box.) The solid card stock is all from Stampin' Up!. Crumb cake is the card base. I did various matts in whisper white, going gray texture, and the inside 'gift' was made with very vanilla. I used three ribbons total. 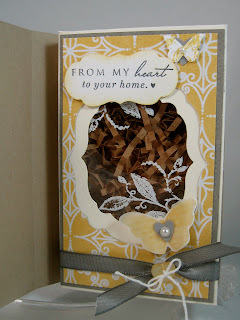 For the outside of the card/gift, I used a crochet trim from Stampin' Up! and a polka dot Kraft ribbon from Paper Trey Ink. On the inside, I used going gray taffeta ribbon and white bakers twine from Stampin' Up!. The butterflies were a collection. The embossed butterflies are from an emboss-lit by Stampin' Up!, and the inside butterfly is actually a stamp I stamped twice (one on card stock and the other on vellum) from Paper Trey Ink. I added half faux pearls from Stampin' Up! to the center of the butterflies, to help convey a girly, feminine 'feel'. 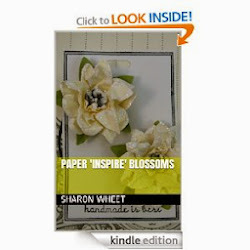 For the flowers on the front of the card/gift, I stacked a paper blossom on top of a fabric flower. I hot glued this floral creation to the top of a gray heart cut from gray textured card stock. I also distress the edges with some picket fence paint. The tag on the front of the card/gift, I cut from a die and stamped the sentiment in going gray classic ink. 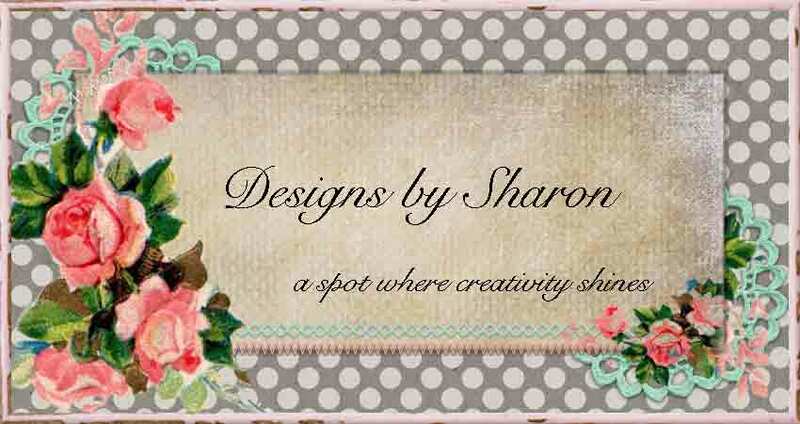 I needed a small and simple tag, so not to distract from the pretty paper and embellishments. I chose this sentiment, because I plan on putting candy inside the box, as the 'gift'. How yummy! I used the new frame dies from Stampin' Up! to create the inside window. I stamped a leaf flourish in snow pigment ink and heat embossed the 'window' with clear embossing powder. 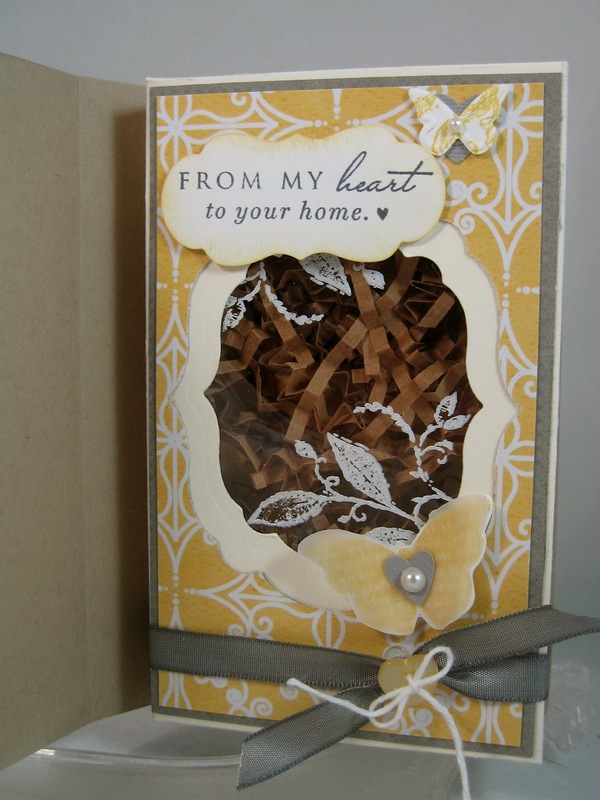 I added some kraft paper shred inside the box so you could see the white embossed leaves on the 'window'. The inside sentiment comes from Paper Trey Ink. I added two hearts cut from the gray textured card stock to the inside, also. One is under the embossed butterfly and the other is on the stamped butterfly. I added half faux pearls to the butterfly bodies, to continue the design from the cover. I tied a yellow heart-shaped button with bakers twine, to the gray taffeta ribbon. I will fill this box with my friends favorite candy: chocolate covered gummy bears. I opened the card/gift combo, so you could see the back of the 'card'. I wanted to show you that I did pay attention to detail and use one large scrap to decorate. I also believe that if you continue the same elements and designs through-out your paper craft item, you will achieve a cohesive design with elements that 'belong' (because they are repeated). Thank you for looking. I hope that you get a chance to play along in any/all of these fabulous challenges. You have made a beautiful job with this card, it has glorious colours in it's palette, and I do agree with you re the repeat/follow through of a pattern to have good composition, sometimes we do not always see cards that have this. Yellow is a splendid colour to work with, it relates light and warmth, it is identified with imagination and enlightenment and it is cheerful. By adding the earthy accents you compliment the yellow and tone down the shade so it comes across creamy. Your stamping and elements all look wonderful. Sharon, this is absolutely gorgeous!! I really love the colors for the color challenge. Good luck!! Sharon, this is so BEAUTIFUL and I LOVE how you mixed all of the products! THX for playing with us at CR84FN! WOW, stunning creation! Thanks for joining us at Card Patterns this week! I absolutely love this Sharon! It definitely is so pretty and feminine! I love the color palette too! This template looks similar to the one I made! So pretty! Thanks for playing with Just Us Girls! This is so gorgeous! I love your project! congrats sis you did it. it is so beautiful just like the creator. love it. Congrats a well deserved honor for such a beautiful project!! Congratulations. What a beautiful project. Love the yellows, flowers and butterfly! Wonderful project - the papers are so pretty! Thanks for playing along with CR84FN!